Judges from the Royal Horticultural Society (RHS) visited Northwich earlier this month to assess the town’s entry into the North West in Bloom competition. Judging took place on Monday 6th August as representatives from the RHS were taken on a tour of Northwich and shown the various displays, projects and initiatives that have been installed and delivered over recent months. 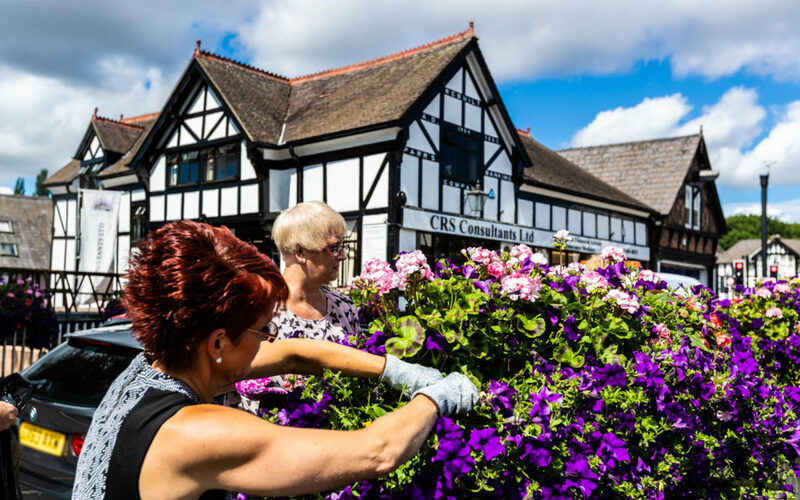 Organised by the Northwich Business Improvement District (BID) with support from Northwich Town Council and Cheshire West and Chester Council, work on the town’s entry began in October 2017 with planning getting under way for floral displays, community engagement and competitions. 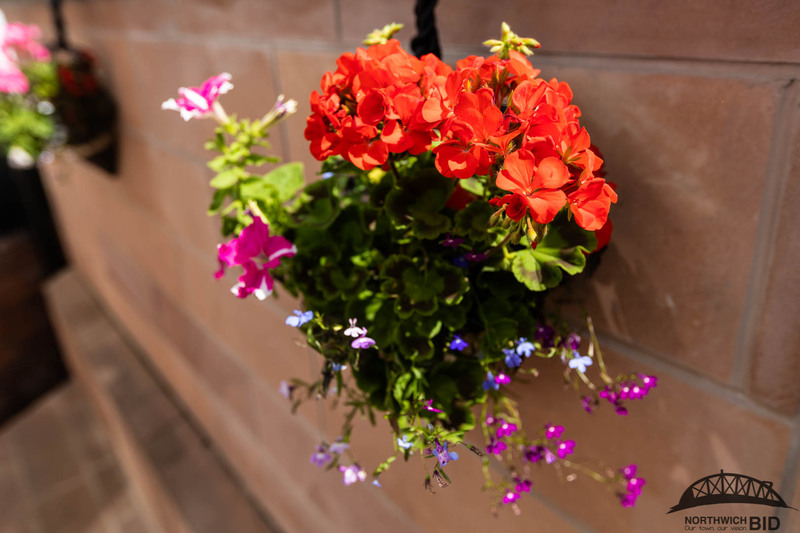 Since then, the streets of Northwich have been filled with colour and creativity thanks to a series of activities and planting days, including the installation of hanging and railing baskets on key gateways to the town, the bedding of floral motifs in River Park and at Northwich Cenotaph and initiatives linking in with Grozone Community Garden. Some of the town’s businesses also got involved as they entered the ‘Best Dressed Business’ competition by decorating shop fronts, gardens, bars and shopping areas, with knitting shop Crafty Stitches emerging as the winner following a public vote. The BID also organised summer activities in the town centre on, and after, judging day with unique and exciting characters linked to the ‘In Bloom’ theme wowing the crowds. Northwich now faces a two month wait until the results are revealed at the end of October in an official ceremony in Southport. Northwich BID Manager Jane Hough feels that the town managed to deliver a successful and comprehensive entry and has thanked businesses, volunteers and the community for all of their work in helping make Northwich bloom. “There has always been togetherness and a community spirit here in Northwich but I think that has shone through more than ever over the last few months with everybody coming together to help make the town’s entry a competitive and eye-catching one. “Businesses have put so much effort in, volunteers gave up precious time to work on projects and local organisations went out of their way to help with what we were trying to achieve. The BID feels proud and humbled with what has been achieved in a relatively short space of time and we’re eagerly looking forward to the results in October. To stay up-to-date with further developments regarding Northwich in Bloom, check out the Visit Northwich Facebook page.